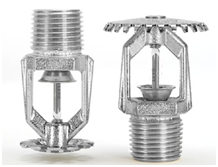 •	Standard coverage, decorative 5 mm glass bulb type, spray sprinklers designed for use inlight, ordinary, or extra hazard, commercial uses such as banks, hotels, shopping malls, factories, warehouses. •	For use in areas with a finished ceiling. The adjustment provided by the Escutcheon Plate reduces the accuracy to which the fixed pipe drops to the sprinklers must be cut. •	Compatible with TY-B Sprinklers. For use in areas that make the sprinklers susceptible to physical or mechanical damage. For other types of sprinklers or accessories, please call 6255 7039 or email to sales@rangerfiresystems.com.sg to enquire.